Concept: This mid-successional Vegetation Type (VT) has an overstory dominated by a range of species, but consistently includes a significant component of eastern white cedar. It is cedar's presence, in either the canopy or high shrub layer, which defines this otherwise variable VT. CE2 stands can be classed as either softwood or mixedwood depending on tree species composition. 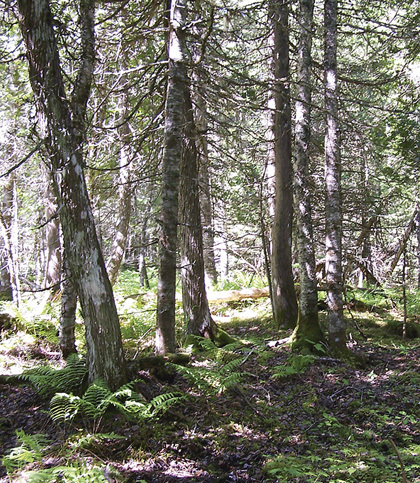 It is an uncommon VT and is the only upland cedar forest found in the province. Vegetation: Eastern white cedar is a co-dominant with several other trees including red spruce, balsam fir, white pine, hemlock, red maple and white ash. Other less common associates are white birch, trembling aspen and white spruce. Development of the shrub layer is variable, but usually includes regenerating trees, beaked hazelnut and fly- honeysuckle. The herb layer is generally dominated by a variety of fern species including interrupted fern, bracken, lady fern, cinnamon fern and oak fern. These species are indicative of the range of moisture and nutrient conditions associated with CE2 stands. The well developed bryophyte layer is dominated by stair-step moss, Schreber's moss and bazzania. Environmental Setting: CE2 is mainly associated with fresh-moist to moist, nutrient medium to rich soils of variable texture. CE2 is an uncommon VT that occurs mainly in western Nova Scotia in the Clare, Annapolis Valley and Valley Slope ecodistricts. It is also found scattered in northern Nova Scotia within the Northumberland Lowlands ecodistrict. Successional Dynamics: CE2 is considered mid-successional, but successional patterns are not fully understood. As a shade-tolerant species, eastern white cedar will regenerate and persist in the understory until an opening in the canopy allows it to develop further. In the absence of a stand-level disturbance, it is likely that cedar will maintain itself as the dominant canopy species. An early successional stage of CE2 may be MW4 (Balsam fir - Red maple / Wood sorrel - Goldthread). Depending on disturbance history CE2 can be even-aged, but it will develop uneven age class structures as it matures. Ecological Features:Occurrences of this small patch ecosystem rarely cover a hectare. Cedar occurs as an intermediate sized tree in this closed canopy forest. Deer may browse cedar heavily in winter, while snowshoe hare will eat the foliage and gnaw young tree bark. Cedar are long-lived and resistant to disease and insects. The oldest Nova Scotia trees exceed 250 years. Cedar wood is very decay resistant resulting in dead trees than may persist for many decades. 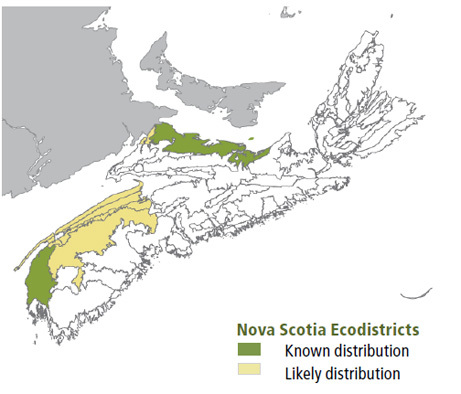 Cedar is legally protected and listed as vulnerable under the Nova Scotia Endangered Species Act. Distinguishing Features: Cedar is the key identifier for this well to imperfectly drained upland softwood and/or mixed forest. 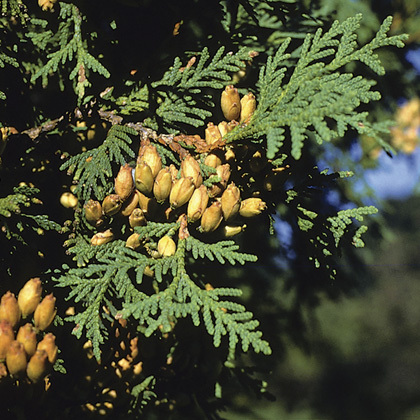 Cedar occurs in the canopy as a co-dominant or intermediate.